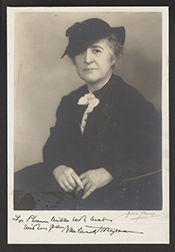 HONEYMAN, Nan Wood, a Representative from Oregon; born in West Point, Orange County, N.Y., July 15, 1881; moved with her parents to Portland, Oreg., in 1884; attended private schools, was graduated from St. Helens Hall, Portland, Oreg., in 1898, and later attended Finch School, New York City; delegate to the State constitutional convention in 1933 which ratified the Twenty-first amendment to the Constitution of the United States and served as president; member of the State house of representatives 1935-1937; delegate to the Democratic National Conventions in 1936 and 1940; elected as a Democrat to the Seventy-fifth Congress (January 3, 1937-January 3, 1939); unsuccessful candidate for reelection in 1938 to the Seventy-sixth Congress and for election in 1940 to the Seventy-seventh Congress; senior representative of the Pacific Coast Office of Price Administration from August 1941 to May 1942; appointed by the Multnomah County Commissioners to the State senate in 1941 to fill a vacancy and served until her resignation in 1942; collector of customs, twenty-ninth district, Portland, Oreg., from May 1, 1942, to July 13, 1953; died in Woodacre, Calif., December 10, 1970; cremated; interment in family plot in Riverview Cemetery, Portland, Oreg. Nan Wood Honeyman in Women in Congress, 1917-2006. Prepared under the direction of the Committee On House Administration by the Office of History & Preservation, U. S. House of Representatives. Washington: Government Printing Office, 2006.